Runners on South West Street in Hillsboro are splattered with color during the Highco Dash for DD 5K Color Run/Walk held Saturday. More than 200 runners and walkers took to the streets in uptown Hillsboro on Saturday morning for the fifth annual Highco Dash for DD 5K Color Run/Walk. Funds raised through the event will be used to help purchase a vehicle for Highco’s male clients. The top three runners to finish were Bradley Kennedy, Doug Sidle and Katy Roades. Keely Schurman was the second female to finish. A handful of vendors were set up before the event on Governor Foraker Place in Hillsboro, where registration started at 8 a.m. The race started at the intersection of Governor Foraker and West Main Street a little after 9 a.m. 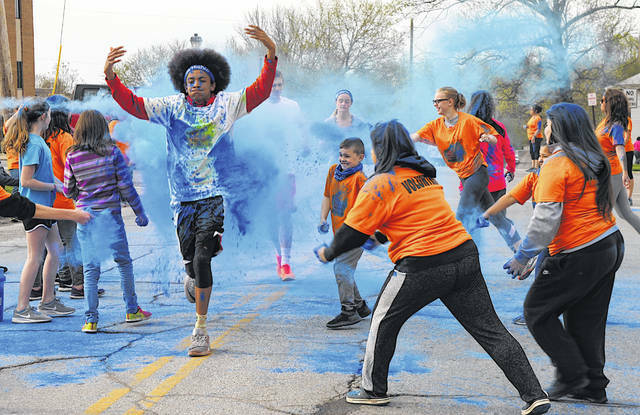 Along the race course, there were five stations where runners and walkers were “splashed” with bright colors of nontoxic powder, unless they requested otherwise. “We put on the race to have some fun and raise awareness for the folks we work with,” Garman said. Highco is a nonprofit organization based in Hillsboro that serves adults with developmental and intellectual disabilities in and around Highland County. It provides transportation services for individuals with developmental disabilities, whether the services are needed for employment, medical services, or just an outing to explore life. March was Developmental Disability Awareness Month, and Highco said it strives each March to spread awareness. “The dash is in April because we are wimps and March is too cold for us,” a handout for the event said.